In other articles, I have extolled the virtues of the Mandarin which can be kept in an urban area without concern that noise will cause the neighbors to complain. There is another type of exotic duck that possesses many of the same qualities and in fact makes an excellent companion to the Mandarin in a mixed collection. I am speaking of the Chiloe Wigeon, which is native to South America, especially to Chile. The Chiloe is about the same size as the Mandarin, is quite colorful (both male and female share the same plumage pattern) and because it does not come from this hemisphere, no federal or state permits are necessary to keep it. It is not at all noisy, it's vocalizations consist of soft and rather pleasant whistles. 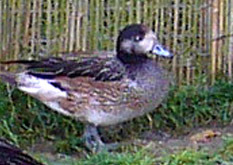 In short, it joins the Mandarin as an ideal duck to keep in situations where other ducks would be prohibited. This Chiloe drake is preening after a swim. 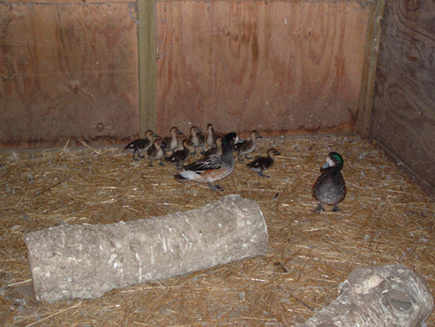 The Chiloe can be kept in essentially the same penning as the Mandarin. It can be permitted to remain full winged or it can be grounded through wing clipping or pinioning. Commercially available grower and breeder feeds are all that is necessary to feed it, although it would appeciate access to grass or other greenery since they are grazers in the wild. 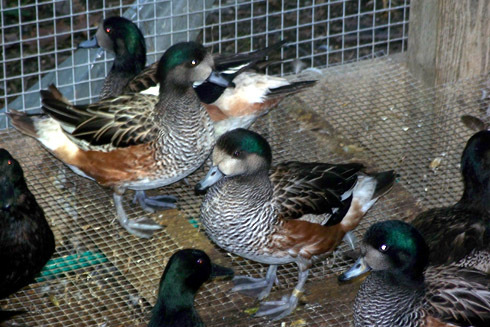 They can be kept in pairs, small flocks, or in mixed collections with other species of waterfowl. Like the Mandarins and most other ducks, the Chiloes appreciate and benefit from swimming water. One of the reasons that the Chiloe is relatively inexpensive to obtain is that it breeds readily in captivity. They breed in pairs, starting at two years of age. They generally prefer to lay their eggs (cream in color) in modest cavitiy nests on the ground. Unlike most other ducks including the Mandarin, the male Chiloe Wigeon takes an interest in it's young and assists the female in caring for the growing ducklings. The incubation period for Chiloe eggs is 26 days. The adult plumage of the immature birds is quite similar to the adults but first year birds possess dark markings in the wing bows which are bright white in the adults. The males are generally a bit larger than the females and possess somewhat brighter coloration, especially when two years old or older. Once sexually mature, the female Chiloes often greet their mates (and sometimes other adults) with a little head bobbing dance which is quite entertaining to observe. In short, the Chiloe fits in well in situations where domestic waterfowl might be found to be objectionable. 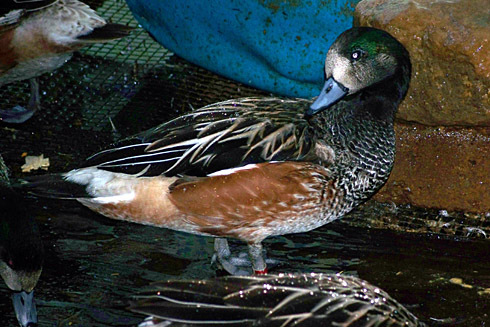 This Chiloe Wigeon is part of John Soper's fine collection of waterfowl in the UK.